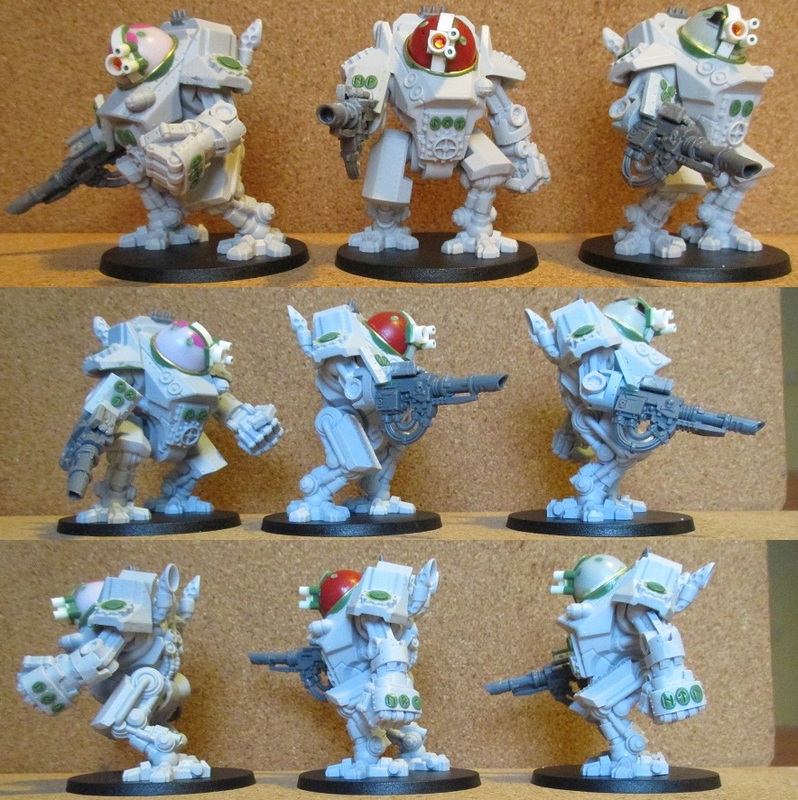 It hhas been another long week but fortunately, I have managed to summon the enthusiasm to work on an element of the Squat army that was relatively simple but took a bit of time; the second squadron of armoured Sentinels. 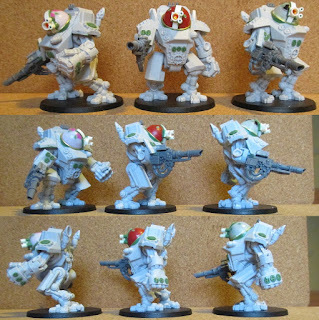 Using some of the money I have amassed from my EBay sales, I ordered in thre Vulkan Battlesuits from Prodos Games. I went direct because the packaging still shows the old style ofmodel (the long limbed version) and I couldn't guarantee that I would get the correct version if I ordered else where. When the Vulkans arrived (after a VERY short while) I counted the components and was happy that everything was there so I cleaned everything up ready for assembly. When it came to assembly, I noticed that there was something wrong... one of the Vulkans had two left legs. This was a big disappointment because I was in the right frame of mind to build the Squadron but could now only build three. I penned a customer request email to Prodos but also risked an order from EBay for a whole new one; just in case my request for a replacement limb was ignored. Needless to say, the whole one turned up from EBay (luckily, the correct type) and I have heard nothing from Prodos. Head - Plastic 'Jumping Bean', Plasticard, Plastic Tubes, Stick on Gems, Green Stuff. Right Arm - Lascannon from Space Marine Centurion, Tau Pulse Carbine, Green Stuff. Smoke Launchers - Chest Weapons from a Space Marine Centurion. As you can see, there was only a small amount of conversion required and fortunately, the sculpting wasn't too intricate so I could manage it even though I have been tired. So... I STILL haven't managed to finish the army command squad. It is still sitting on my workbench but I just don't seem to have the 'mojo' to finish it at the moment. I am sure it will happen soon... I just need to get my head right first. As I mentioned before, my dad is in hospital after injuring his neck. He will be in hospital for a while and I have been going to see him at the weekends... but it is a 6 hour round trip and when you don't sleep too well, it sort of takes its toll a bit. That is why I have slowed down a bit with hobby stuff recently because I am at a place now where everything I pick up gets dropped, I put finger prints all over my sculpting work and I glue myself to anything I happen to be assembling at the time. This weekend, he was moved to a hospital another half hour away so the drive is now a seven hour round trip... fortunately, he is recovering well but it is still going to be a long road to recovery and even then, he will have to amend his routine to cater for his new restrictions on his mobility. That's it. I'm off. I have a lunch date with my son who has a weekend pass from basic training. It will be great to hear what he has been getting up to over the past four and a half weeks. See you from atop a soaring eagle! They look terrific, though its sad to hear that "Prodos" continue to provide poor support. Fingers crossed you get the correct leg at some point. If the worst comes to the worst, I can adapt the leg to fit... but it was too much work to do in my available timeframe so I got a new kit. It will get done if I don't get the part turn up... it's a shame though. "..and I glue myself to anything I happen to be assembling at the time."